Successfully Added OnePlus 3 Smartphone - Android 6.0, Snapdragon 820, 6GB RAM, 4G, Dual Wi-Fi, 3000mAh Battery, Fingerprint Scanner, 16MP Camera to your Shopping Cart. A top of the line Qualcomm Snapdragon 820 CPU and 6GB of RAM mean the OnePlus 3 has a performance that rivals that of flagship devices from SAMSUNG and Apple. This smartphone won't baulk when it comes to demanding apps or running the latest games. The OxygenOS, based on Android 6.0, has exceptional memory management and leaves oodles of memory left over for you to use on apps, games and multitasking so it seamlessly switches between apps, plays media and managers the needs of the most demanding users effortlessly. Equipped with a 5.5 inch AMOLED display, offering a 1080 by 1920 resolution the OnePlus 3 finds a nice balance between size and usability. It handles 16 million colors with sublime accuracy and delivers rich visuals. With a superior contrast than standard displays you can enjoy sharp high resolution viewing even in bright daylight conditions. Protected by Corning Gorilla Glass 4 the screen is going to keep looking pristine for longer as it's resistant to scratches and safe from drops and knocks. When it comes to design the OnePlus have upped their game with this latest Smartphone and it comes with a full-metal body that is much more attractive than previous incarnations on the OnePlus brand and more in keeping with its flagship desires. This premium metal uni-body results in a looks that is pleasing to the eye and feels great in the hand. A highly responsive fingerprint scanner is quick to recognize your digits and will unlock the phone in a fraction of a second so you won't have to remember passcodes or screen patterns any longer. A USB type C port is located at the base of the phone and brings quick data transfers as well as allowing you to recharge the 3000mAh battery, which, is large enough to offer solid usage times. There is no micro SD card slot on this phone but with 64GB of internal storage this hardly matters. You do get two 4G SIM card slots, so it is easy to manage two numbers and organize work and personal contacts with ease, supporting a wide array of bandwidths these two SIM slots enable great network coverage so you'll get a stronger signal for longer. With faster data rates the 4G connectivity and dual-band Wi-Fi let you download content faster than ever which is great for stream movies on the go. A 16MP rear camera is a nice offering and brings quality images that make it hard to take a bad photo. This ensures you will enjoy impressive photos that are true to life and well exposed. Added to that is a front 8MP camera that will bring good quality selifes for those must have snaps. 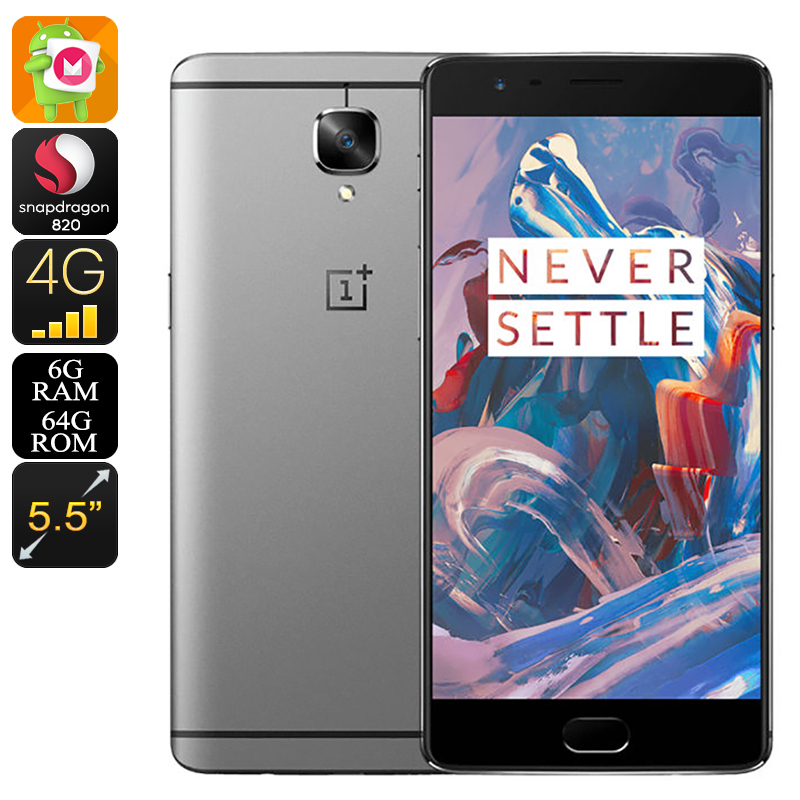 The OnePlus 3 Smartphone comes with 12 months warranty, brought to you by the leader in electronic devices as well as wholesale Android phones..